The District Department of the Environment recently released their FY11 Accomplishments Report which lists the many ways that Washington DC government is working hard with citizens and organizations to keep DC “clean, vibrant and healthy for future generations.” It’s another one of those documents that I really wish I could publish here, in its entirety. But since I can’t, I encourage you to download the document and at least skim it to learn about all of the great things going on in DC. Individuality defines who we are. We are unique. One in billions. Yet, the billions of us have one thing in common: our planet earth. When it comes to the environment, our fates are the same. We share the sun. We breathe the same air. Whether we believe the “butterfly affect” – a theoretical example of a hurricane’s formation being contingent on whether a distant butterfly flaps it’s wings – as hard fact science or just poetic metaphor, we, as a collective force, have much more influence over climate change, for example, than we could ever imagine. The District is #1 per capita in the amount of LEED certified and ENERGY STAR buildings. The District uses more green power than any other jurisdiction in the US EPA Green Power Community. The District has the largest bicycle share program in the country and is second in the country in the number of commuters who walk to work and take transit. The DDOE WPD's RiverSmart team had an outstanding FY11. TheRiverSmart Schools team worked with five District public schools to identify, plan, and construct low impact development (LID) retrofits and outdoor learning gardens, and funded numerous teacher trainings on effective use of schoolyard gardens in the school's curriculum. Through its grantees—the Alliance for the Chesapeake Bay, Casey Trees, and DC Greenworks—DDOE installed 575 rain barrels, permeable pavers on 14 driveways and patios, and 180 rain gardens; and planted 151 native plant gardens and 681 trees. Collectively the practices installed in FY11 through RiverSmart Homes are treating 21 acres of land in the District. I’ve been writing a few posts on trees lately to go along with this month’s poll (see sidebar). I’ve learned a lot of great things that are worth sharing. 10 Reasons that Trees are Good for Humans. 9. Trees provide food – almost too obvious to list, but so important to all of us! Although this is a little outside of the Metro DC area, it sounds like a very interesting workshop and goes along with the theme I’ve been writing about lately – TREES! The workshop, entitled The Woods in Your Backyard, consists of two sessions, scheduled one week apart, to give you time to put what you’ve learned into practice between sessions. It is geared towards property owners that own less than ten acres of property – wooded or not! The primary focus of the workshop is to learn to create and enhance natural areas around your home so that certainly can apply to any size property. Workshop dates are 2/15 and 2/22 from 6:30 pm – 9:00 p.m. The workshop uses the manual The Woods in Your Backyard: Learning to Create and Enhance Natural Areas Around Your Home. You can register and download the brochure about the program on the Forestry for the Bay website. I’ve been running a poll on this blog and on our Facebook page, asking why people plant trees. To go along with it, I started a post this morning listing the benefits of trees. Well, the list just kept growing and growing and growing so I haven’t gotten it finished just yet. In the meantime, I wanted to share one of the main reasons I love trees – they attract hummingbirds! People sometimes ask me how they can attract hummingbirds to their property and I often mention that they should plant a tree. Yes, hummingbirds are attracted to certain tree species that have nectar flowers, but they also love having trees that provide them with a place that they can sit and keep an eye on their “domain”. Hummingbirds are very territorial and they love to sit in a tree and overlook the other hummingbird plants in your garden or the feeders that you place out for them. As soon as they see a rival hummingbird appear, they will immediately swoop down and chase them away, and then return to their perch in the tree. They also eat gnats and other small insects that fly around trees and certain species have been known to eat sap that oozes from holes created in trees by woodpeckers and sapsuckers. Hummingbirds also typically nest in trees. The first time I saw a hummingbird sitting in one of our oak trees, I was in complete awe. And I have to admit that I spent a good part of that summer moving a ten foot ladder around my yard and taking thousands of photos of those little guys. So, the number one reason that I will ALWAYS recommend that people plant trees is, hummingbirds love them! 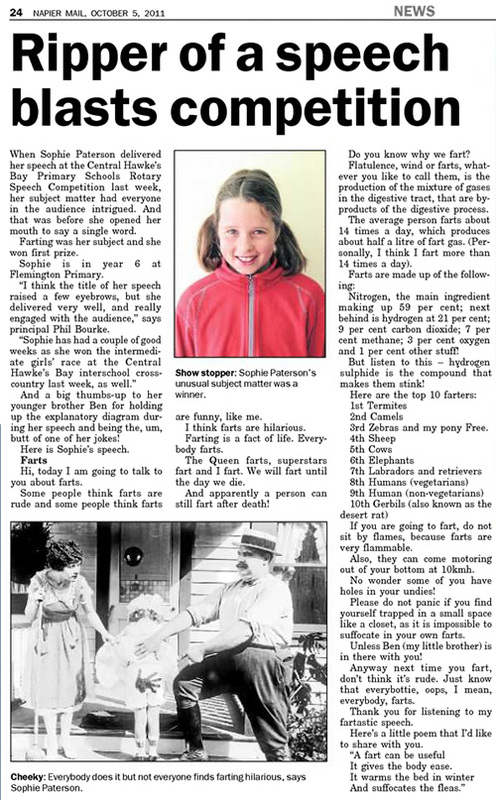 My friend Sidney emailed me a cute article she found online about a speech a young girl named Sophie Paterson from New Zealand made about farts. (see copy below) The article is getting passed (no pun intended) around the internet quite a bit, mostly because no matter how mature or sophisticated we think we are, farts still make us titter. According to Ms. Paterson's essay, termites are number one on the list of top farters. AND, according to the EPA website, termite farts are the second largest natural source of methane emissions. Termites. Global emissions of methane due to termites are estimated to be between 2 and 22 Tg per year, making them the second largest natural source of methane emissions. Methane is produced in termites as part of their normal digestive process, and the amount generated varies among different species. Ultimately, emissions from termites depend largely on the population of these insects, which can also vary significantly among different regions of the world. And methane is one of the contributing factors to global warming. So quit blaming the cows, sheep and elephants for all of that errant methane. Blame it on the termites. Ask someone if they have a favorite tree, and many are quick to name a particular species. It often takes a little more “digging” to come up with the answer to “why”. But since digging is one of my favorite things to do, I decided to ask around. I started with some of the staff at Casey Trees. If you don’t know about Casey Trees, they are a D.C.-based non-profit group committed to restoring, enhancing and protecting the tree canopy of D.C. They plant trees, teach other people about trees, and work with elected officials, developers, and community groups to make sure that the population of trees in D.C. continues to grow forth and multiply. Ten years and over 10,000 trees since their beginning, it’s obvious to see that they DEFINITELY “dig” trees. Jared’s favorite tree: The eucalyptus, while not native to North America, has certainly made itself at home along the west coast particularly in California where I am from. Growing up, I would build forts at the base of these giants using its tessellated bark for roof materials, soak up its sweet scent emitted from its distinctive long, blue leaves and lounge in its shade on hot summer days. In short, the eucalyptus tree reminds me of home and a time when my only worry was when the end of recess bell would ring. Marty O’Brien, COO: When I was growing up in Minneapolis in the late 1970s, there were many big and beautiful elm trees lining the boulevards in our neighborhood and throughout the city. At some point the city came through and marked many trees with an orange “X” and soon removed all of those trees. It drastically changed the character of the neighborhood and the city for the worse so, at about 10 years old, I realized for the first time the impact that trees could have. We didn’t know what we had until it was gone. So that is why I chose the American elm (N) as my favorite tree. It was the first real connection I had with trees. Mark DeSantis, Development Associate: It’s not just the bursts of golden yellow leaves that dot D.C.’s streets during the fall that make the ginkgo my favorite tree – though in my opinion there are few things more beautiful to see in this city. For me it’s more their history and the fact that they’ve been around for so long that fascinate me. They are truly a relic from the past that has survived for so long – something few things in this world have managed. It’s this uniqueness that I find beautiful. Oliver Pattison, Communications Associate: I am a fan of the pin oak (N) because it is a great large-canopy street tree with a significant presence along certain D.C. streets. I know that oaks are not everyone’s favorite type of city tree because of concerns about falling acorns, but they more than make up for it with their beautiful fall foliage. I discovered that I liked pin oaks in particular by walking around Mount Pleasant and Kalorama Park in the fall. Christopher Horn, Communications Associate: There are many species of oak in my home state of Kansas, but none like the willow oak (N). When I moved to D.C., I was not only amazed at how many trees there were, but also by the uniqueness of the willow oak. The tree has a dense canopy and its oblong willow-like leaves go from a bright green in spring to a beautiful yellow-orange in the fall. The willow oak is a sight to see in any season. Sara Turner, Urban Forestry Manager: The artist in me loves sassafras (N) for its color and three distinct leaf shapes, some simple others lobed, which make this tree's identification fun. I especially love the one shaped like a mitten resembling the state of Michigan, where I studied woody plants. In the fall, the leaves transition to striking hues of orange, red, and yellow. I am easily charmed by the spotting of Sassafras on a fall hike. Lisa Morris, Planning and Design Associate: Allentown, PA, where I’m from, has beautiful sycamore (N) lined streets where the branches form an almost solid mass. These giant trees framed the streets I grew up on. Michael Potts, GIS Specialist: The blackjack oak (N) is a small, scrubby survivor, though one can grow very large if given proper resources. There are some small specimens at the top of Sugarloaf Mountain in Maryland, but I first came upon them as they grow natively on my family’s ranch in Texas. I loved taking walks through the forest populated by blackjacks and post oaks. They always had a rugged appeal to me. Tom Buckley, Director of Technical Services and Research: Having a favorite tree is a little like having a favorite ice cream. I don’t think about it much. But the Baobabs in Zimbabwe surprised me, as a little kid on safari. You could crawl around inside them. I had a tree-house, but this was a tree that could actually house you. And they grew very large in dusty, dry climates. Rather than choosing one favorite tree, Shawn Walker, Urban Forestry Instructor, described the importance of following the practice of right plant/right place. In my opinion, right plant/right place is even more important than choosing natives. Choosing trees that are suitable for your property’s site conditions will generally require less water and less harmful chemicals – both of which are great for the local environment. Shawn Walker: I chose “right tree, right place” because it’s kind of a theme around here: for a planted tree to thrive one must consider the site-specific constraints and chose a species thus suited – ‘right tree, right place’. When I came to work at Casey Trees a year ago, I was surprised that no other staff had chosen this as their favorite, so I nabbed it right away! ‘Right tree, right place’ describes a thoughtful approach to tree selection and landscape design but it also reminds us that there is room for our attitudes towards trees to be more nuanced, something more than simply ‘I like/dislike that tree’. Take the argument about native versus non-native species, for instance. I used to staunchly believe that native species should always be planted when possible. However, as I have become more aware of the threats to our urban forest from climate change and exotic pests, this bias has become somewhat murky. Now that we’ve started digging, how about you. Do you have any favorite trees? Wood Ashes in the Garden: Good or Bad? One of the things I love the most about cooler weather is the nice cozy fires that my husband builds in our fireplace and outdoor fire pit. Whether it’s because he is a Sagittarius (one of the fire signs of the zodiac) or just because he grew up in a campfire loving family, Tom starts building fires as soon as the temperatures begin to fall. Needless to say, we end up with a LOT of wood ashes. The first time I cleaned out our fireplace (over ten years ago now) I piled huge buckets full of ashes into our compost pile. It just seemed somehow logical to me, putting decomposed wood back into the earth. Tom, my green-gardening guru hubby, just shook his head. Then he told me to get a shovel and he helped me dig them all back out and put them in a metal container so we could better control their use in our landscape. I wasn’t WRONG about the nutritional value of wood ashes. The truth is that wood ashes contain most of the 13 essential nutrients that soil must supply for plant growth. The secret is just to make sure that you utilize those nutrients ONLY as needed. When applied directly to garden soil, wood ashes will raise the pH level. This is great if the pH level of your soil is low. Not so great if the pH level of your soil is already high. In fact, over applying wood ash can cause serious imbalances in your soil. The pH value is a measure of a soils acidity or alkalinity and directly affects the ability of plants to utilize the nutrients available to them. The pH scale ranges from 0 to 14, with 7 as neutral. Numbers less than 7 indicate acidity while numbers greater than 7 indicate alkalinity. So how do you determine the pH value of your soil? You get your soil tested. Getting your soil tested is an excellent way to help minimize the use of chemicals in your yard. Knowing what your yard needs allows you add only what is necessary, eliminating the possiblity of harming your yard or causing excess nutrients to find their way into our waterways. If the pH level of your soil is low, then adding wood ash may be beneficial. Again, this depends on what you want to grow. Wood ash is beneficial to most garden plants except acid-loving plants such as blueberries, rhododendrons and azaleas. The value of wood ash depends on the type of wood you burn. Harwood ash has a higher percentage of nutrients than ash from softwoods. Lawns that need lime and potassium can also benefit from wood ash but you should apply no more than 10 to 15 pounds of ash per 1,000 square feet of lawn and only every couple of years. Wood ash is alkaline, which means you should use precautions when handling it. Do not scatter ashes in the wind. Trees. What's not to love. They give you shade, fruit, flowers, fragrance, firewood and so many other great things. So I'll be focusing on trees and the people who love them in my next few posts. In the mean time, why do you love trees? Answer our poll or use the comments section to add an answer of your own. What is or would be your primary motivator for planting a tree in your yard? If you are like me, you are a little amazed and sometimes overwhelmed by all of the great info there is floating out there on the internet. For me, one of the greatest ways to sort through everything and find what is pertinent to me is by using twitter. By selectively choosing who I follow, I have a constant stream of thoughts, ideas and articles that add information, motivation and inspiration to my life. The really cool thing is the way that information is passed along from one user to the next. One great bit of info or insight can be passed along to hundreds and thousands of other followers by the simple use of the Retweet! Ya gotta love that technology! Just today, I found this great article about pervious paving in a tweet from @hcconservancy . Pervious paving is a great way to allow water to seep into the earth, cutting down on stormwater runoff and pollution. Every day, I get great motivational quotes from @AnnTran_ such as this one that she tweeted a few minutes ago. "Just be nice, take genuine interest in the people you meet, and keep in touch with people you like." — Guy Kawasaki"
And since I'm mentioning people I follow, I have to mention @DerekMarkham just because he was one of the first people I followed, years ago, and he never fails to disappoint! His twitter profile pretty much sums him up: Generally green, sprinkled with randomness & slathered with peanut butter. Father, blogger, new media fool. Good man. Skilled shoveler. Full of snark. I could go on and on about the great info that you can find on twitter. There was a time when I thought that twitter was ONLY for people who had smartphones. Until I became a twitterer myself, I didn't realize how fun and easy and important it would be! Native plants are very popular in eco-friendly landscapes. Some people like them because of their drought tolerance and low-maintenance requirements. Others like them because of their wildlife value or their pure, unadulterated beauty. I recently ran across a list entitled Plant This, Not That on the Garden Club of Virginia website that was created for their 2011 annual meeting. A paragraph at the top of the list explained how the list was compiled. Garden club members from around the state were asked for suggestions for native plants that had wildlife value, but not in the traditional sense of providing seeds or berries for wildlife. Instead, they were asked to list plants that attract butterflies, which in turn, produce caterpillars which are used as food for many native bird species. For our GCV Annual Meeting we are focusing on good garden practices that encourage the growth cycle of our native birds and butterflies. Many of you may know that our native birds are in decline because of loss of native habitat for the specific caterpillars that feed our young birds. Non-native plants do not offer breeding ground for any native butterflies, and 97% of our birds require insects-not seeds-to feed their young. Therefore we are asking each club to bring in a cutting or small plant that is native and attracts butterflies, and a picture of a non-native landscape plant that may be replaced by your specimen in a backyard landscape. The display will be titled "Plant this, not that!" It’s a great list, because it helps us “think outside the box” when recognizing the wildlife value of native plants. I mentioned many of the plants on the list, including paw paw, sweet bay, milkweed and passion vine, in a post that I did on butterfly gardening. But from now on, I’ll remember to mention their value for attracting birds, as well. And don’t forget to take our native plant poll and check out the other lists of native plants listed under Our Most Popular Pages, both of which can be found in the blog’s sidebar. WHEATON, MD—GreenWheaton is partnering with Brookside Gardens, Silver Spring Green and Safeway to present a free screening of the award-winning documentary, Bag It: Is Your Life Too Plastic? Bag It follows ‘everyman’ Jeb Berrier as he tries to make sense of our dependency on, and single-use mentality towards, plastic bags. Although his quest starts out small, Jeb soon finds our ‘plastic problem’ extends beyond landfills to oceans, rivers and ultimately human health. Visit Brookside Gardens Visitor Center on January 9, 2012 at 7 PM to watch this engaging film and learn about the simple steps we can take to reverse this alarming trend. You will never look at plastics in the same way again. The event is free, but seating is limited. Safeway will be providing free recyclable grocery bags on a first come first served basis. Hundreds of butterflies will take flight in Lewis Ginter Botanical Garden's glass Conservatory in 2012. The Butterflies LIVE! exhibit is back by popular demand and will feature showy tropical species from May 25 - October 14, 2012. The exhibit will also feature special plantings to provide food for the butterflies, allowing visitors to get an "up-close" and personal view of these fascinating creatures. This exhibit is presented by the Robins Foundation. Bookmark this list or print it out! You won’t want to miss these eco-friendly events and garden tips for 2012. Celebrate National Bird Day on January 5, 2012 by setting out bird seed for our fine feathered friends and planning your summer wildlife garden. February 6th – 12th, 2012 is Go Green Week – a national week of action on climate change in schools, colleges and universities. It’s a great week to start planning a butterfly garden with your kids. World Water Day is March 22, 1012 - International World Water Day is held annually on 22 March as a means of focusing attention on the importance of freshwater and advocating for the sustainable management of freshwater resources. Mark the day by adding a few rain barrels to your landscape. April is National Garden Month – Every April communities, organizations, and individuals nationwide celebrate gardening during National Garden Month. 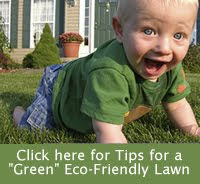 Trends for 2012 point to more and more gardeners choosing eco-friendly options. April 15-21, 2012 – National Environmental Education Week - dedicated to increasing the environmental literacy of K-12 students. Do your part to help grow your own Environmentalist. 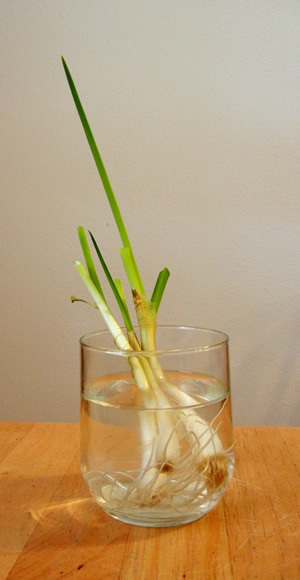 April 22, 2012 – Earth Day – Creating an eco-friendly garden is a great way to celebrate the earth every day. May is National Wetlands Month - Support and promote wetlands by informing community members about wetlands' vital roles, "adopting" a wetland, joining a local watershed group, or participating in a wetland monitoring, restoration, or cleanup project. There are many other actions Americans can take to help conserve wetlands. To learn more about what you can do to help protect and restore these valuable natural resources in your state or local area, visit What You Can Do to Protect and Restore Wetlands. National Public Gardens Day – May 11, 2012 – a celebration of botanical gardens, arboreta, and other public gardens takes place. World Environment Day – June 5th, 2012 - World Environment Day is an annual event that is aimed at being the biggest and most widely celebrated global day for positive environmental action. Celebrate the day by making a pledge to eliminate chemicals from your landscape. July is smart irrigation month – Find a watersense irrigation contractor to help tune-up your irrigation system. August is National Water Quality Month. Learn how eco-friendly gardening helps to protect local water supplies. September 11. 2012 is Protect Your Groundwater Day. Eliminating chemicals, using rain barrels, and picking up after pets are all great ways to protect the groundwater. Pollution Prevention Week – July 16th – 22nd, 2012 (third full week in September) This week is an opportunity for individuals, businesses, and government to emphasize and highlight their pollution prevention and sustainability activities and achievements, expand current pollution prevention efforts, and commit to new actions. October 4, 2012 – World Animal Day - In the garden, Invite the critters. Whether you want to attract butterflies, hummingbirds, beneficial insects other pollinators or wonderful wriggling worms, eco-friendly gardening is your first step. Make a Difference Day – 4th Saturday in October – Acts of kindness can come from the garden, too. America Recycles Day – November 15th - Since 1997, communities across the country have come together on November 15 to celebrate America Recycles Day - the only nationally recognized day dedicated to the promotion of recycling in the United States. Creating compost is a great way to recycle in the garden. Christmas Bird Count – December 16th – January 5th? Since the 12th annual Christmas Bird Count is still under way, the dates for the 13th annual count may not be set yet. But participating is a great way to prove that our eco-friendly gardening efforts are making a difference.